Show how this pentagonal tile can be used to tile the plane and describe the transformations which map this pentagon to its images in the tiling. The lengths AE and ED are 1 unit and the length CD is 2 units. 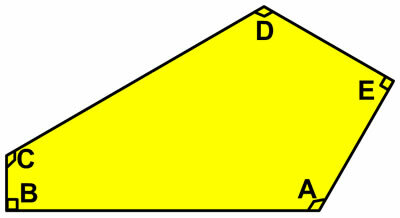 The angles B and E are right angles and the angles A, C and D are 120°. Here is a printable copy for you to download, print and try yourself. Here is an interactive that may help you. Click on the grey shapes to create new tiles. You can rotate the pieces using the corner points. Regular polygons and circles. Games. Angle properties of polygons. Tessellations. Generalising. Compound transformations. Visualising. Small software. 2D shapes and their properties. Interactivities.